A lot of the marketing articles I’ve read talk about focusing on what you bring to the table and why a person should pick you/your business to provide whatever it is you’re offering. I get that, and employ a good amount of that in my social media and here around the site. But less often do I see addressed the flip side: letting people know when they should go elsewhere. It’s basically a way to have potential leads auto-eliminate themselves from your audience, based on criteria of who you don’t want to work with. It’s a time saver for both business owners, because it was never going to be a good match, and neither wasted time going back and forth via email or phone. Ideally, then, the people who do actually end up contacting you are well-qualified leads and more likely to fit into your target audience. 1. You aren’t part of the creative and lifestyle sectors I focus on. It’s taken me a while to define the kind of clients I want to work with, and that is clients in the creative or lifestyle sector. Think food & drink, writing, art, culture, events, wellness, etc. If your business doesn’t fall under that umbrella, then we’re not a good fit. I’m sure your business is great, but you’re going to want to find someone who is interested in and specializes in your type of business. 2. You are only hiring a designer because you don’t know how to use the Adobe programs. I get it, the Adobe programs are expensive and tricky to learn. But if you think that Adobe mouse-pushing is all that a designer brings to the table, you’re missing the point of design. A designer’s job is as much about strategy and innovation in coming up with the design and making sure it works for your business, as it is about the execution of the design. Though obviously a good designer excels at that, too. If you are going to ignore your designer’s advice and expertise, and just want them to put it together as you instruct (or worse, request to look over their shoulder while they work), then you can go elsewhere. I want to work with clients who actually value the design process and a designer’s perspective and experience. 3. You have a problem with signing a contract or paying a deposit before work begins. Yes, currently Studio Guerassio is just me, an individual. But it is still a business, and I run it as such, down to all of the legal nitty gritty. A contract is a piece of security for both parties, as it details the responsibilities and rights of each side. A deposit serves several purposes: a) it secures your spot in my workflow; b) it shows me you’re serious about this project and ready to get to work; and c) it serves as payment for time I spend researching and prototyping before you may even see the first concept. If at that point we discover we’re not a good match after all, I am not out a loss for those hours worked. Refusing to sign a contract or pay a deposit is a non-starter for me; we will not be working together. It’s not. You are not my boss. For one thing, you’re not paying for my health insurance, or retirement, or taking out taxes for me. I handle all of that. Which means you don’t get to dictate what hours I work, or my payment terms, or insist I be at your beck and call exclusively. I have set office hours, and payment terms will be clearly outlined in the contract you sign. For project work, I give you a timeline of when you can expect drafts from me, and respond to emails in a reasonable timeframe. None of this is unusual, nor, I feel, objectionable. Basically, if I’m getting the work to you when I say I will, and it’s done well (which of course, it will be, because hello that’s what I do), then you don’t get to demand anything further. If that doesn’t work for you, then I don’t work with you. 5. You are looking for a cheap price tag rather than design that is well done and best fits your business. Good, tailored design takes time. And professional designers deserve to be paid for their time, just like any other profession. If you honestly think it makes no difference to your business having a stock clip art logo you can get for $5 rather than a professionally designed, custom one that has been properly fitted to your business and audience, then we are never going to form a good working relationship. You should just take yourself off to Fiverr right now. 6. You are not prepared to answer questions about things like your target market and what makes your business unique. In order to design well for your business, I need to get to know it. I do that by asking a lot of questions. These are questions that, as a business owner, you should’ve given some thought to over the years. Even if not, you should be able to come up with an answer – if not immediately, at least in the timeframe before we sign the contract. If you can’t do that, or are dismissive of the importance of such questions, then you’re crippling my ability to design effectively for your business. Since that’s not a position I like to put myself in, I would turn down the project. If any of those apply to you, then thank you for stopping by, but please move along. We would not be a good fit to work together. On the other hand, if none of the above apply to you and you’re looking for a designer to craft the visual voice for your business or event, hit me up. What are some non-starters for your business? 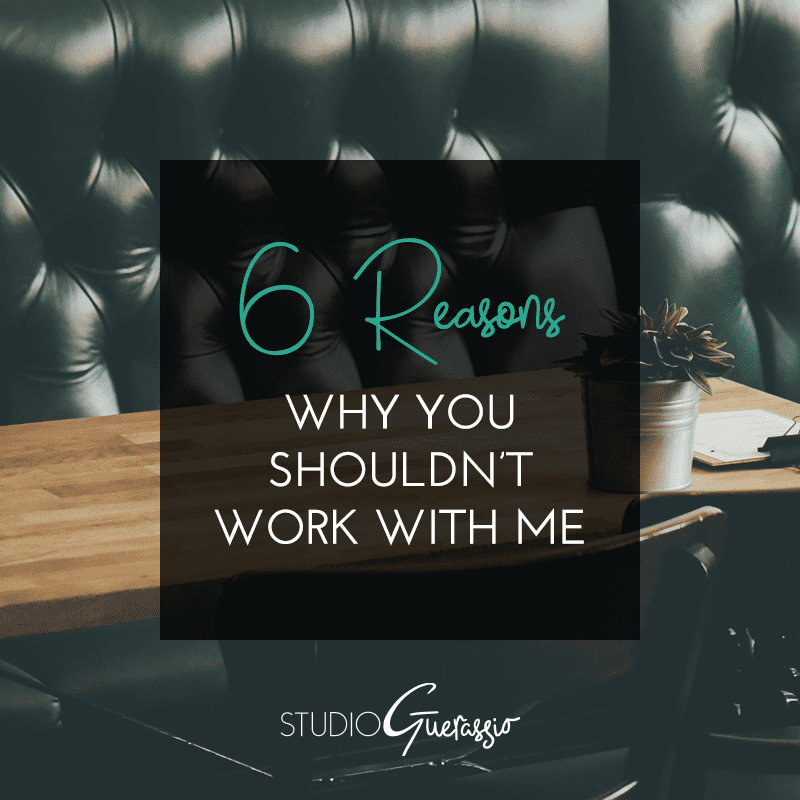 Bonus reason #7: if the tone of the above blog post bothered you, our personalities are also probably not a good fit for working together.